CHESAPEAKE, VA—In response to the deadly shooting at a Parkland, FL high school earlier this month, Dollar Tree officials announced Thursday that the discount variety store will no longer sell assault weapons. 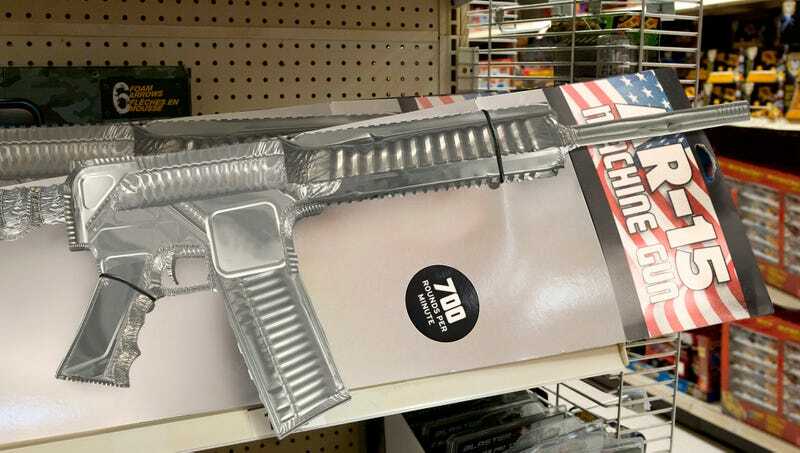 “Under no circumstances should a teenager be able to walk into a Dollar Tree, purchase a Basic Brands ValuPak aluminum foil rifle for one dollar, and shoot up a school with it,” said CEO Gary Philbin, adding that other items to be removed effective immediately from shelves in all 13,600 locations include Good Sense clear plastic bump stocks, RitePrice high-capacity magazines, and the entire Essential Products line of disposable flash suppressors. “We are determined to provide customers with the best value around, but in light of this terrible tragedy, we cannot in good conscience continue to offer deals like Home Bargain’s three-for-one semi-automatic shotgun bundle or our 6.8 mm Remington SPC bargain bins.” While military-style rifles will no longer be available from Dollar Tree, Philbin reassured customers the store will, of course, continue to offer a wide selection of discount handguns after enforcing a 21-and-over age restriction.